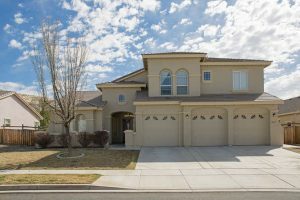 This gorgeous home in a very popular Wingfield Springs community demonstrates a wonderful combination of beautifully engineered design in 3137 square feet of open living space. The entire house bathes in bright, natural light from its freshly refinished floors and high, arching ceilings. With a sweeping family room, a spacious kitchen, 4 bedrooms, 3 bathrooms, and an additional loft space, this house makes the most of every inch of its interior. The master bedroom in particular includes an attached master bathroom with double sinks, a garden-style tub, and large walk-in closet. Both the master and the other bedrooms in the house also include double pane windows with pre-installed blinds so that you’ll always have the privacy you need. The large, open family room includes a gas fireplace that serves as a focal point of the space, and provides the perfect area to enjoy cozy winter months. The bright kitchen is also a lovely place to gather the family, with a large island, breakfast nook, granite counter tops with beautiful back splash and stainless steel appliances. The laundry room is conveniently accessible, and features a sink and additional cabinet space. With the separate dining area and attached 3-car garage, everything in this home fits together perfectly. Even the backyard has spaces marked out for gardening and custom landscaping, so you can craft your very own view to admire when you relax on the brick patio. This is truly a wonderful property in a fantastic community and it will move quickly! Schedule a private tour today!